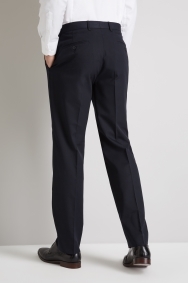 Give your work wardrobe an instant promotion with these stylish navy trousers from Moss Esq. 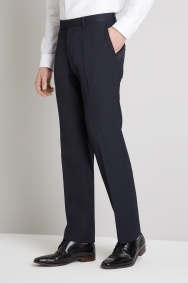 Versatile and durable, these flat-fronted formal trousers are ideal for bolstering your range of everyday essentials. Generously cut for a regular fit, they're a supremely comfortable option that'll take you from a breakfast meeting through to evening drinks and dinner. The blended fabric is machine washable and makes them tough enough for everyday wear. Dress up with a crisp shirt, team with brown derby shoes and a matching belt, and reach for a classic tie when you need to smarten up in a hurry. Trousers didn't fit but packaging and returns service was brilliant. ????? ????????????? ???????? ?? ?????. ?????? ??????? ?, ?.?. ?? ? ???????? ???? ?, ??? ??????? ? ??????? ???????? - ??????? ??????????? ? ?????????. ??? ?, ?? ??? ????? ?, ?? ?????? ??????? (navy), ?????? ????????? ?, ????? ? ???????. ? ????? ??????? ?????????. Extremely happy with the clothes purchased and the online ordering and delivery was faultless. No worries at all. Fits perfectly. Best shop. Recommend strongly. Very good price for lovely fitting trousers. Good material. It's my first experience. Not disappointed. Excellent quality product and fit. Perfect fit for me, sometimes long legs are not long enough but these were spot on (34). Excellent, great fit, extremely comfortable and has a fancy trim inside making them appear more expensive than they actually were. slightly long on length, but great trousers. The trousers fit perfectly and the quality is excellent. I ordered 34 waist and it was too small and the trouser leg width was too wide, looked like a parachute. The slim fit chinos I ordered in 34 waist was a perfect fit. Great fitting and excellent quality especially for the price. Nice fit, good quality material and very practical for everyday work-wear. Goes well with my shirts. Trousers are fine, the sizings are complete rubbish. Good quality. Would definitely recommend to anyone. Superb value for money...bought another three pairs! Quality product which fits perfect in length and waist with customer service excellent. Exactly what I was looking for. Good quality. Great price. The trousers were of good quality. It was a gift for my dad and he absolutely loved it. I'll be ordering again soon. Good fit apart from the leg length in regular which is longer than other stores. The service you provide goes above and beyond expectations please keep this up. As expected, fits nicely appropiate room for legs and thighs.